On March 13 the Department of Education celebrated the inauguration of its new UC Irvine Ph.D. in Education with a campus distinguished lecture. Featured speaker was Professor David Perkins, Ph.D., of Harvard University, an eminent educational psychologist. 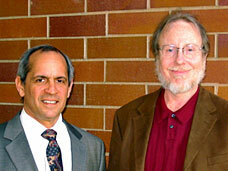 Dr. Perkins is known for his research in the areas of creativity, intelligence, and the teaching of thinking. UC Irvine faculty, staff, administrators, and students joined guests from Orange County communities in the Cal IT2 Auditorium to congratulate members of the first class of Ph.D. students and listen to Dr. Perkins' thoughts on the kinds of knowledge that should be developed in K-12 and university classrooms. Dr. Perkins introduced his topic, "Thinking to Go", by posing the question: "What do we want people to learn and how can they learn it so it really matters?" Dr. Perkins posited that a fair amount of what youngsters learn in conventional schools really doesn't matter very much. "It's sort of there for the quiz or whatever and then evaporates a little later. Yet, that's certainly not our vision of what we would like for education. The whole point of education, after all, is knowledge to go. It's not knowledge that just stays in the classroom, stays long enough for the quiz at the end of the week or the end of the month. It's knowledge that informs people's lives and energizes them, that provides some vision; it provides ways of making sense of the world to function well in the world." Describing "knowledge to go", Dr. Perkins identified four characteristics: the knowledge is alert, expansive, adventurous, and proactive. He suggested that educators should consider three themes when developing curricula: scope of knowledge, conception of knowing, and manner of learning. Regarding scope of knowledge, Dr. Perkins observed: "An understanding of wide scope is central to its home discipline, but it is illuminating beyond the discipline, and it is proactively mapped into the world." This contrasts with narrow-scope knowledge expressed as "a curriculum that is about itself, that is to say, about propagating itself forward, generation by generation, essentially an empty curriculum." ​In explaining the second theme, conception of knowing, Dr. Perkins contrasted three different conceptions of knowing: (1) retention and application, which he characterized as possessive: "I know what I know in my mind and can retrieve and re-present"; (2) understanding: "being able to reason well and solve problems"; and (3) active, adventurous conception of knowledge, which Dr. Perkins described as "proactive". He views proactive knowledge as dispositional: "It's not just a matter of ability, it's a matter of attitude." ​On the third theme, manner of learning, Dr. Perkins acknowledged that there is ongoing debate about terminology used to discuss transfer of learning but that the important questions are when, why, and by what means transfer occurs. To illustrate, he presented two models. The High Road/Low Road model (Soloman & Perkins, 1994) incorporates reflected abstraction and practiced automaticity. "If you actually look at the pattern of failures and successes in transfer, most of the occasions where not much transfer was found are occasions where there was neither reflective abstraction nor much varied practice." A second model, Inventing to Prepare for Learning, from Schwartz and Martin (2004), begins not with the content but with a problem situation where individuals invent their own solutions. "The net effect of all that tends to be knowledge to go, knowledge that is understood and obtained, and that can be applied flexibly in other situations....This can be viewed as a neat complex packaging of, on the one hand, reflective abstraction and, on the other hand, a practice generated by the sequence of events." Dr. Perkins cautioned audience members to be aware of contrasts in the literature on transfer with real world situations. For example, in transfer studies, learners perform other people's tasks vs. managing one's own agenda; many of the transfer tasks used for laboratory studies involve analogical applications whereas many of the important applications in the world are quite literal; most laboratory tasks involve a clear demand to perform; and there are no well-studied data on response competition, i.e., how developing new knowledge is affected by old habits or commitments. Dr. Perkins closed his lecture with a discussion of "learning for later" versus "learning from now". He reminded the audience that much of the instruction offered in schools is portrayed as important for use later in life -- in effect, students receive "promissory notes" regarding the importance and applicability of the subject they are studying. He offered four options for learning from now: problem-based learning, project-based learning, community participation, and inquiry learning. Dr. Perkins identified four advantages associated with "learning from now". 1. The endeavor is experienced as immediately meaningful and worthwhile in itself as well as representative of something larger. 2. Knowledge is woven in here and there as it is needed as well as revealed by the unfolding experience. 3. Conflicting knowledge from past experiences converges, and resolutions are negotiated through thought and experiment. 4. Considerable learning occurs automatically and is extended by knowledge teased out through underscoring reflection and targeted rehearsal. 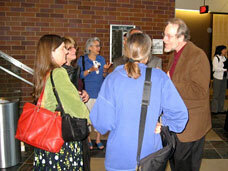 Following the lecture, Dr. Perkins responded to questions and engaged in discussions with individual audience members during the reception in the atrium. Dr. Leticia Oseguera has received a UC Accord Grant for her research study, “Why Do Asian American Students Do Better in School? : Understanding the Roots of Social Capital Among African American, Mexican American, Vietnamese American, and White High School Youth. The study will employ a mixed methods design evaluating NELS data and a Southern California High School. The NSF CreativIT program has awarded Dr. Richland and Bill Tomlinson (ICS) a grant to support their research: "Computational Metaphor Identification for Supporting Creativity in Science Education." Office of Naval Research awarded Dr. Richland and three UCLA professors funding to study "Analogical Reasoning: Integration of Neural, Behavioral and Computational Analyses." ​Dr. Richland also received a Faculty Career Development award from UC Irvine. The transition to middle school is often marked by decreased academic achievement and increased emotional stress African American children exposed to social risk may be especially vulnerable during this transition. To identify mediators and protective factors, severity and timing of risk exposure were related to academic achievement and adjustment between 4th and 6th grade in 74 African American children. Longitudinal analyses indicated that severity more than timing of risk exposure was negatively related to all outcomes and that language skills mediated the pathway from risk for most outcome. Transition to middle school was related to lower math scores and to more externalizing problems when children experienced higher levels of social risk. Language skills and parenting served as protective factors while expectations of racial discrimination was a vulnerability factor. Results imply that promoting parenting and language skills and decreasing expectations of racial discrimination provide pathways to academic success for African American children exposed to adversity during the transition from elementary to middle school. Burchinal, M. R., Roberts, J. E., Zeisel, S. A., & Rowley, S. J. (2008). Social risk and protective factors for African American children’s academic achievement and adjustment during the transition to middle school. Developmental Psychology, 44, 286-292. Burchinal, M. R., Vernon-Feagans, L., & Cox, M. (2008). Cumulative social risk and infant development in rural low-income communities. Parenting: Science and Practice, 8, 41-82. Howes, C., Burchinal, M., Pianta, R., Bryant, D., Early D. M., & Clifford, R. (2008). Ready to learn? Children’s pre-academic achievement in pre-kindergarten programs. Early Childhood Research Quarterly, 23, 27-50. Powell, D. R., Burchinal, M., File, N., & Kontos, N. (2008). An eco-behavioral analysis of children’s engagement in urban public school preschool. Early Childhood Research Quarterly, 23, 108-123. Dr. Carol Booth Olson and Richard Land, two recipients of this year’s Alan C. Purves Award, reflect on their work (reported in RTE, Vol. 41, No. 3, pp. 269-303) on “A Cognitive Strategies Approach to Reading and Writing Instruction for English Language Learners in Secondary School” and the lessons they learned from their original research study as they tried to replicate the project in two additional districts outside their service area, to determine if the implications of their study would hold beyond the local context. The Allan C. Purves Award is given to the RTE article in the previous volume year judged most likely to impact educational practice. Isaac Prilleltensky’s (2003) concept of psychopolitical validity stresses the need to consider both the political and the psychological nature of power in the study of wellness, oppression, and liberation. The authors advocate that psychopolitical validity would be strengthened if it included an explicit appreciation of historical context. The inclusion of historical knowledge offers a greater insight into how power has been exercised to promote and maintain oppression, as well as helps to identify methods for working towards social justice. The authors illustrate how the dynamics of power change over time by using examples of how the field of psychology (including community psychology) treated two historically oppressed groups: African Americans and women. Consistent with epistemic validity, investigation into the history of these two groups demonstrates how the role of psychological research has both contributed to the oppression of others, as well as promoted social change. Consistent with transformative validity, these examples illustrate how marginalized groups can work within an oppressive system to challenge the status quo and, in turn, change their position in society. California is one of 4 states that have accelerated addition and subtraction basic-facts memorization. This article reports on teacher practices, first-grade achievement of the standard, and a broader conception of basic-facts competence. Even among students from the highest performing schools, fewer than 11% made progress toward the memorization standard equivalent to their progress through the school year. Several negative correlations between instructional strategies and student retrieval suggest that teachers may benefit from professional development targeted at basic-facts teaching and learning. Textbook reliance was negatively correlated with basic-facts retrieval, suggesting that educators and policymakers may want to reexamine assumptions about the efficacy of traditional first-grade textbooks. This study’s findings may prove useful to teachers, professional development trainers, and textbook publishers as they consider ways to improve basic-facts learning among early elementary children. ​Research on middle school participants’ engagement in afterschool programs shows that such programs often serve as developmental contexts for promoting "flow" experiences. Compared to when they are in other settings after school, participants in afterschool programs are more likely to experience high concentrated effort and intrinsic motivation, experiences consistent with Csikszentmihalyi's concept of flow. Organized sports, arts enrichment, and academic enrichment activities were found to be particularly engaging program activities, in contrast to homework completion. The importance of high levels of engagement in promoting learning in afterschool programs leads to implications for practice and policy. ​Middle school students' experiences in and out of after-school programs were collected throughout the 2001-2002 academic year, and analyzed in this paper in order to determine if they predicted developmental and academic outcomes. The students (N = 196) attended eight programs in three Midwestern states. A total of 4,970 experiences were randomly sampled during weekday, after-school hours using the Experience Sampling Method (ESM) during one week in the fall and one week in the spring. A variety of measures of students' school engagement and behavior, psychosocial competence, risky behaviors, and academic performance were collected in the beginning of the academic year to construct baseline variables and at the end of the year to construct outcome variables. Automated writing evaluation (AWE) software employs artificial intelligence to core and provide feedback on essays. This multi-method case study tracks the use of AWE over a three year period in two Southern California school districts. A survey of teachers, interviews with teachers, and classroom observations all supported the hypotheses that classroom use of AWE can lead to increased writing practice, increased revising, and increased student motivation to write and revise. Scores on the English Language Arts portion of the California State Test improved in one district where AWE was introduced in conjunction with other writing reform efforts. Although teachers reported that students wrote more and the software made teaching easier, use of the software was moderate overall. Usage patterns were shaped by peer support, professional training, institutional attitudes and policies, the availability and reliability of computer hardware and networks, and teachers' prior instructional practices. Intergrating Writing and the Arts: How Effective? Evidence has been steadily accumulating that learning in the arts involves principles shared with other academic disciplines. The studies in Critical Links (Deasy, 2002), a compendium of arts education research, demonstrate that well-conceived arts activities have a variety of positive effects beyond the initial conditions of learning. The study summarized here looked at specific ways in which the arts can be a potentially formidable ally in increasing student achievement (Bransford et al, 2004). A quasi-experimental study investigated whether there was an increase in student writing skills as a result of implementation of an integrated arts-and-literacy curriculum at the secondary level. In September, and again in May, students of selected teachers who had participated in the ArtsCore professional development program were asked to write an essay to a prompt taken from the California High School Exit Exam (CAHSEE). A matched control group did the same. A total of 782 student essays were collected. University of California, Irvine, English instructors were recruited to read the essays, which were blindly scored, using the 4-point rubric used to score the essay component of the CAHSEE. Treatment group students did significantly better than controls. As Co-director of the IES study, Dr. Santagata described the design and summarize the findings of a four-year study of a mathematics professional development (PD) program implemented in a high-poverty school district. The PD program was based on results from the Third International Mathematics and Science (TIMSS) Video Study. The TIMSS study revealed that mathematics lessons presented in high-achieving nations were mathematically sound and cognitively rich- requiring students to engage deeply with mathematical concepts and skills throughout the entirety of their lessons (Hiebert et al., 2003). The PD program under study was designed to test the effects of exposing urban middle school teachers in the US to both a greater level of mathematics content and to video-taped examples of mathematics lessons that engaged students deeply in mathematics. ​Classrooms are complex settings and teachers need to learn what to pay attention to and how to make sense of what they observe. This is particularly important given new views of mathematics teaching and learning, where teachers are being called on to adopt a flexible approach to teaching, adapting their instruction, at least in part, based on the ideas students raise. Thus, teachers need to learn how to pay attention to student ideas, to reason about these ideas in the midst of instruction, and to make instructional decisions based on their analysis. How do teachers learn to examine classrooms in this way? One model, namely video clubs, uses video records from teachers' classrooms to help teachers learn to examine student thinking. In this paper, I report on a group of seven elementary teachers who participated in a video club and developed in the ability to “notice” student thinking. Data analysis resulted in identifying a framework for learning to notice student thinking. This framework examines teachers' analyses of four dimensions of classrooms, actor, topic, stance, and specificity and identifies four levels in their development of noticing: baseline, specialize, focus, and extend. The results examine the development of video club’s group noticing within this framework. In addition, I consider particular features of the video club design that may have influenced teacher noticing. ​With their increased presence in urban enclaves, after school programs have the potential to positively affect the lives of immigrant youth and their families. These programs can serve as transitional spaces, helping youth to navigate new social contexts, make links to the broader community, build social capital, and cultivate their sense of civic engagement. This paper examined how immigrant youth and their families experience a career oriented and technology intensive after school program in a community learning center. Through ethnographic interviews, observations, and artifact analysis, we explore how youth in the center express their cultural identity and develop new affiliations while developing new knowledge and skills to succeed in the broader society. ​Teacher turnover in urban districts arouses great concern among practitioners and policy-makers. To help meet the pressing need for teachers committed to urban schools, some teacher education programs have begun to focus specifically on the preparation of teachers for urban contexts. This interactive symposium will focus on current research about the preparation of teachers in urban-focused teacher education programs at research institutions, and will also examine how these programs shaped the subsequent career pathways of their graduates. Taken together, these papers explore how these programs shape pre-service teachers' commitment to urban schools and how this commitment translates to teachers' future career decisions. These papers focus on urban teachers at different career stages and use a variety of complementary research methods. ​This paper presents findings from a quantitative study examining the extent to which pre-service preparation predicts beginning teacher retention and movement. Applying an expanded definition of retention, and controlling for demographic and school level variables, the study used national data to determine the associations between pre-service teacher preparation program components and types, and the retention of educators in the classroom, specifically high-poverty classrooms, and in the education profession. Binomial and multinomial logistic regression were employed to examine predictors of staying in and leaving the classroom, moving between schools, and shifting roles within the field of education. The study found that while program types and specific programmatic components significantly affect teachers' retention in the classroom and the field of education, a school's poverty level does not. ​UCI Ph.D. in Education student Laurie Hansen and California State University, Fullerton Professor Evelyn Weisman studied a group of ten Latino/a pre-service teachers who were student teaching in urban and suburban schools. Participants in the study were bilingual in Spanish and English and enrolled in a multiple subject credential program with a bilingual-bicultural emphasis (BCLAD: Bilingual Cross Cultural Language and Academic Development). The study employed interviews to explore the pre-service teachers' experiences with schooling and their observations while student teaching. Findings reveal that participants' life experiences and unique responses to cultural conflicts influenced their ability to relate to Latino students and parents and their desires to teach in Latino communities. However, participants demonstrated minimal recognition of forces that contribute to inequity, and none expressed the need to challenge traditional practices. Findings support the need for professional development programs for teachers of color to incorporate ongoing critical reflection of life experiences to promote political consciousness. "Student Teaching in Urban and Suburban Schools: Perspective of Latino Preservice Teachers" will be published in the November 2008 issue of Urban Education. Limited research has focused on efforts that address Latina/o psychosociocultural (PSC) needs, programs that have effectively involved Latina/o parents and efforts that could be implemented to further integrate Latina/o parents into their children's educational process. Padres Promotores de la Educacion is a program of the Santa Ana Partnership administered by Santa Ana College (SAC); the Partnership is a collaboration between Santa Ana Unified School District, Santa Ana College, California State University, Fullerton, the University of California Irvine, and community-based organizations. The program, initiated in 2001, has the goal of connecting parents to school services and delivering information about higher education to the Latino community through nontraditional methods (e.g., home visits, platicas in community areas, etc.). It empowers parents to understand educational information required to navigate the educational system and provides a social network for engagement with the ultimate goal of exposing their roles as advocates and educators about the education process K-20. Over 300 parents have participated in this program and approximately 40 programs complete serving as promotores during one year of service. Using both qualitative (observations and interviews) and quantitative (survey) data, the authors highlight the elements of Padres Promotores, parents' attitudes toward higher education, the psychosociocultural factors that contribute to these attitudes, and the influence the program has on its participants. ​The objective of this paper is to bring awareness to the need to adequately assess the impact of college-bound programs in actual college-going rates at a school-wide level, going beyond the more common program-specific target population and to stimulate dialogue among practitioners regarding the most effective approach in measuring the impact of various programs in traditional public schools and meaningfully analyze patterns that can uncover the power of collaboration between specially-funded college-bond programs. ​Miguel Mendivil, CSU/UCI doctoral student in Cohort III, CSULA emphasis in Urban Educational Leadership, was a participant in the Indigenous Peoples of the Americas SIG Business Meeting. Mr. Mendivil is focusing his doctoral research on the power and influence of storytelling and pedagogies of the home on the critical thinking and learning styles of urban Mexican American and Native American children. The growth in the Latina/o population has increased their representation in postsecondary institutions. Yet, merely 10% of all Hispanic Americans ages 24-64 currently graduate from four-year institutions (National Center for Education Statistics quoted in President’s Advisory Commission, 2003; Solórzano & Yosso, 2000). Notwithstanding years of retention efforts, graduation rates of Latinas/os remain alarmingly low and Latinas/os remain among the least likely racial/ethnic groups to complete their bachelor’s degrees (Astin & Oseguera, 2003; Berkner, He, & Cattaldi, 2002; Fry, 2002). The purpose of this review is threefold. First, we go beyond traditional theory and highlight those scholars who shed new information on retention for Latina/o students. Second, we summarize factors that affect Latina/o students in particular. Third, promising practices for effectively retaining Latina/o students at two- and four-year higher education institutions are highlighted. This manuscript examines the number of Hispanic individuals who serve as president or chancellor and the type of institution they serve. In 2001 only 13 states had institutions in which the president or chancellor was Latina/o. By 2006, that number had increased to 22. Both in 2001 and 2006, 61% of all Latina/o CEOs served in associate’s degree institutions. Of the 180 institutions in the continental United States that were members of HACU in 2007, only 56 or 31% had Latina/o CEOs. Latina doctoral students highlighted some of the most poignant aspects of their experiences as they navigated the world of academe. Using testimonios (Latina Feminist Group, 2001) to form a collective consciousness and affirm personal experience as legitimate truths, the panel validated the diversity within and between Latinas who contend with various forms of oppression due to sexual orientation, immigration status, social class, and different life experiences. This interactive workshop highlighted the transitions from Master’s to Doctoral programs for first-generation college students. Having found the common threads in the challenging yet, rewarding PhD application process, recently admitted doctoral students shared the most poignant aspects of their experiences. Negotiating family expectations, personal lives, and even questioning the decision to undertake doctoral studies unlocked some of the most memorable, intense, and complex periods of self-reflection for the students. This session provided a synthesis on what has been learned over the years with respect to Latina/o populations and retention. Primary emphasis was on four-year colleges with two-year college information also included. In an effort to learn how other institutions are working to retain their own Latina/o populations, participants highlighted successful practices at their institutions. Crystal did her student teaching at Top of the World School (TOW) in Laguna Beach the year it opened. She was able to participate in developing a model program of team teaching and differentiated staffing. Both the teachers and the students continually changed classrooms throughout the day in order to create a learning environment best suited for each student in every subject. Crystal loved teaching at TOW but after graduation from UCI accepted a job in Placentia school district where she could work with disadvantaged students. “It was a teacher’s market and school districts were courting the most desirable teachers. I was able to select the class I wanted at the school I wanted. I chose a junior first grade (a class for children who placed developmentally somewhere between kindergarten and first grade) at Van Buren Elementary.” While Crystal enjoyed the children and valued her contributions, she found the professional climate at Van Buren differed markedly from TOW. “I was able to partner with another new teacher, but Van Buren was a school where the other teachers went into their classrooms and closed the doors. The teachers were good, but I missed the collaboration and the innovation at TOW.” After one year Crystal returned to Laguna Beach where she taught four additional years, until her first child was born. ​When Crystal and her husband Paul started their family, Crystal decided to focus on raising her children. Continuing to use her talents, she joined her parents in their interior design business, which gave her the flexibility to spend time with her children and volunteer in their classrooms once they started public school. In due course, she incorporated her teaching experience into her children’s school by developing and implementing a gifted and talented program, teaching in the Junior Great Book program, tutoring in the classroom, and serving on the PTO/PTA and as PTO President for both elementary school and high school. As her children advanced through the grades, Crystal ran for and was elected to the Capistrano Unified School District (CUSD) Board of Trustees. She served 18 years on the CUSD Board, including three terms as Board President. Additionally, she served two years as the President of the Board of Trustees of the Capistrano-Laguna Beach Regional Occupational Program, as President of the Orange County School Board Association, and 15 years as a delegate to the California School Boards Association. Other activities have included Chair of the Children and Families Commission (First Five Commission of Orange County); membership on the California State Senate Select Committee on School Readiness; President of the Board of Directors for the Niguel Children’s Center; President of the Laguna Beach Girls Club Board of Directors; member of the south county council of United Way; and member of the Advisory Board of Beta Foster Care. During her years of service, Crystal regularly communicated with her state and national congressional representatives. She was appointed by the President of California School Boards Association to join with their executive committee in representing school board members from California and traveling to Washington D.C., where they met with the Secretaries of Education; Health and Human Services; Labor and Transportation; and the Drug Czar. Crystal emphasized that teaching is a profession. “Teachers should conduct themselves as professionals in their dress, in their actions, and in their instruction.” Additional words of advice included: arrive at school fully prepared; be flexible with lesson plans and capture the teachable moments; communicate with colleagues, planning and teaching together when possible; love and treasure your students; and maintain a sense of humor. ​UC Irvine is fortunate that Crystal Kochendorfer will be joining the Department of Education’s new Leadership Council, where the Department will be able to draw upon her years of experience.